In this page, you will find a compilation of Baby and Toddler Recipes and also Kid's After School Snacks (Indian) Recipes. I frequently get mails from many moms asking me what snacks to give their kids when they come back from school, what to pack in their snack box etc. I have tried my best and have chosen foods that are not deep fried nor has any preservatives, artificial food colors or maida/all purpose flour in it. Most of the snacks listed below does not even have white sugar (except the custard recipe) in it. I have used only jaggery for most of the recipes. Help your children develop healthy eating habits early in life. 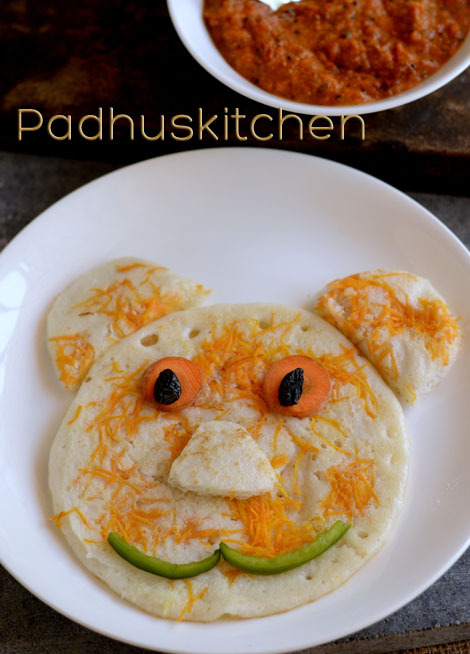 I have also given links for some fun food for kids. Enjoy and have fun with your kids!!! You can give them fresh fruits, fruit juice, milkshakes, fruit popsicles etc. Not only they are filling but also very delicious and healthy. Kids will love it for sure. Check the link below for milkshake and fruit juice recipes. You can also freeze fruit juice in Popsicle molds and give them during summer. All sundals are good for health and are rich in protein. You can give them sundals in a cup after they come back from school. You can prepare a variety of sandwiches, sandwich toast with multi grain bread or brown bread and give then as snacks in the evening. It is healthy and filling. You can check out my 100 Breakfast Recipes for few sandwich and sandwich toast recipes. Refer easy sandwich recipes also. If you found this page useful, I would really love it, if you pin it or share it with your Facebook fans or Twitter followers or Google+ circles today. All it takes is a simple click on the “pin it” “like,” “share,” “tweet,” or Google+ buttons below the post. It will keep me motivated. Thank you! Start with less quantity and wait for 2-3 days to see if it suits her. Then you can continue with less quantity. Increase gradually. For babies, it should not be spicy. You can give idly also as it is steamed and easily digestible. Will you add salt to the idly battery for babies less than one year?? Hi padhu I have been a regular reader of your blog's.. infact it's a habit now before starting to cook I always check your blog. Could you also start a section for pregnant women on the traditional foods to eat week by week? Sure, I will consult elders and doctors and soon start a section. I am not aware of the root you have mentioned. Vettiver is a grass. You get dried ones in the market. That is what I have used in homemade bath powder. It is fragrant and has cooling properties. If you cannot get that, you can skip that. Hi padhu i'am sandhya from vizag,i regularly follow ur recipes and try as well airecipes comes very well with ur useful tips.pls suggest me the recipes for my 1 year daughter to put her at 5 pm. I tried porridge but she is not eating. Hi Padhu, Have you prepared any protien powder for kids to mix it with milk. Actually, I didn't want to give packed protien powder. Can you please share if you have any?